West Virginia was formed because of the difference of opinion in Virginians during the civil war era. 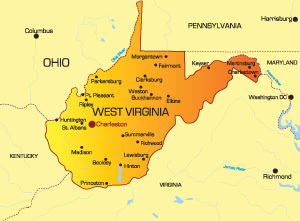 West Virginia is bordered by Kentucky, Ohio, Pennsylvania, Virginia, and Maryland. The state has a population of 1.85 million people, with 51 thousand people living in the capital city of Charleston. Some major highways in West Virginia are I-77, I-79, I-70, I-81, I-64, and I-68. The busiest airport in West Virginia is the Yeager Airport in Charleston. Well-known colleges in West Virginia include West Virginia University, and West Virginia State University. Some tourist attractions include the Harper's Ferry National Historical Park, whit water rafting, and the Oglebay resort.